I spent this weekend “drinking from a firehose” as Jon Pozadzides put it on the first day. I’ve been using and developing for WordPress for the last few years so I wondered what I would actually get out of WordCamp. Several of the speakers reiterated things that I knew but have failed to act on. Others such as Giovanni, discussed ways to use the system to our advantage. He went on to say that what we do is not about marketing but about trust. If we spend time each day helping out people on the web, then we will build trust and people will begin to seek us out. That is way more effective than spending thousands of dollars on advertising and marketing. The point of consistency was hammered home throughout the weekend. You can’t expect to gain readers if you’re only posting semi-annually. The idea of using video to increase the effectiveness of your message was covered from every angle. Cali Lewis discussed the 7 rules for building a vibrant community. Two points really stand out. You have to be an asset. You have to be proactive and provide a benefit to the community you are building. You cannot sit on the sidelines. It comes back to trust. If you provide a benefit and your community trusts you then your community will thrive. If not, you’ll be just another “blogger” getting 5 page views a month and all from your mother. “Passion without Vision will Fail.” My life epitomizes this statement. I’ve got so many ideas for websites and business ideas running through my head but I have no direction. Once the shiny wears off, the project or idea languishes in stasis. Matt Mullenweg gave his “State of the Word” address. 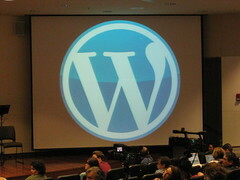 He talked about where WordPress came from and where it is going. He discussed the ways WordPress is taking the best things about other social media sites such as Twitter and Facebook and integrating those into WordPress. With these new systems residing within WordPress you can replicate the functionality of Twitter and Facebook, but you’ll own your data and it won’t be locked in a walled garden. I enjoyed all the presentations but I have to admit, I really went to WordCamp for self-serving reasons. As a under-employed contractor, I went looking to network and find work. I’m an introvert by birth, so I forced myself to socialize and got to meet quite a few people. Then later this afternoon, I decided to see what kind of response I would get on Twitter. I knew a lot of people were following the conference so I made asked if anyone needed a developer. I got several responses almost immediately. I want to publicly thank everyone who put in countless hours into a not-for-profit conference simply because they love the community. I had a great time and I’m looking forward to see how the community will grow and what contributions I can make.